http://www.huismarseille.nl The layered structure of the house is very much suited to combining different exhibitions and highlighting the relationships between them. The programme is diverse, with an emphasis on the visual quality of the works displayed. Huis Marseille covers a broad range of international photographic genres, including photography of artistic inspiration but also all imaginable forms of photography from past and present. Work from the collection of Huis Marseille is also shown regularly. 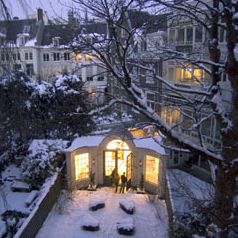 Huis Marseille is based in a 17th century canal house. The stone tablet on the facade, with its map of the harbour of Marseille, dates back to the French merchant who had the house built in 1662. In 1993 the De Pont Museum for Contemporary Art in Tilburg bought the house with the intention of restoring it, in order to provide space for a new cultural initiative in the field of photography: Huis Marseille. The architectural firm of Benthem Crouwel and restoration architect Laurens Vis have restored the house to its original state as much as possible. At the same time they made the house suitable for its new role as an exhibition centre for photography. Close : Mondays, January 1st, April 30th and December 25th, open on other holidays, including Easter Monday and Whit-Monday.